You can now say goodbye to the second-generation processor and welcome a more energy efficient Haswell fourth generation processor. The i7 4770k processor ship in two configurations that cover both the mobile and desktop market. The chip features the HD graphic 4600 engine that is also known and the GT2. The second chip is with iris Pro graphics 5200 or the GT3e is also in the market. The engineers of Intel claim that with the Iris Pro it has the ability to scale incredibly well when given a lofty power ceiling and enough cooling. 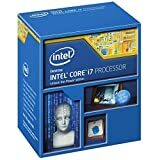 The i7 4770k is the successor of the core i7 3770k processor. This processor has the much needed boost to its on board graphics and has a better power saving mechanism for better efficiency. The architecture of this processor has dramatically risen when it comes to power consumption with today’s CPU range starting at just 15w for the core i7-4650u all the way up to the core i7-4770k that a scale of 84W and has a higher TDP CPU in the pipeline too. Intel has introduced on chip memory that is in the form of an eDRAM cache. With this CPU, you are going to see a big push for energy efficiency. This processors have gained a lot of reputation in the market because the CPU capability to help you in building a balls-the-the-wall system around them.These fourth generation Haswell CPUs are really doing well in the market because of their efficiency and power saving mechanism. These CPUs have endowed the high-end graphic engines such as the BGA only meaning that they have soldered down. For this reason most of the computer enthusiasts are buying the LGA 1150 equipped motherboards that has the core i7 and core i5 CPUs with four cores and HD graphics 4600. The i7- 4770k Haswell processor is composed of 1.6 billion transistors up from the comparable ivy bridge configuration that had about 1.4 billion. The processor is also optimized expressly for Intel’s 22mm node with the die measuring about 177 square millimeters that are slightly larger than the quad core ivy bridge that is 160mm square. Another significant improvement of the Haswell’s IPC compared to the Ivy Bridge is the speedup where a top end core i7- 4470k that runs at 3.5GHz. The Intel also adds two executions ports to this processor that feature a 256 bit fused multiply add units that enables it to double the number of peak theoretical floating point operation per cycle. The core i7-4470k processor has an 8 MB shared L3 cache and 16 lanes of PCI express 3.0 connectivity with a validated memory data that rates up to 1,600 MT/s. Because of the Intel’s fully integrated voltage regulator the desktop lineup thermal target are quite different. However, an upper bound of 84W is not that extreme by any stretch with a floor of 35W. Another reason why the i7- 4770k processor is great is due to its improved quick sync. The previous processors quick sync versions exposed three predefined blends of quality and performance that Intel called target usage. This time round Intel has improved this fourth generation processor to have seven predefined blends of performance and quality.